This book shows you how to combine the best design principles of the past with the technological advances of the present to achieve a more satisfying community environment. Anton Nelessen advocates design by democracy: involving citizens and public officals in planning and designing their own communities. He describes techniques planners can use to help residents create a common vision. Nelessen has successfully used these techniques â€” the Visual Preference Survey and Hands-on Model Building Workshop â€” in seminars and workshops for more than 25 years. 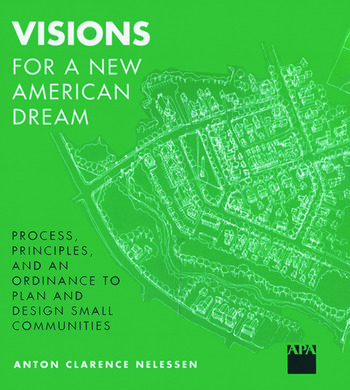 Visions for a New American Dream outlines a seven-step planning and design process for creating three basic types of traditional small communities: hamlets, villages, and neighborhoods. Nelessen presents 10 design principles â€” ranging from humanism and ecological responsibility to open space design and community focus â€” to help planners and designers turn a community's common vision into reality. Visions for a New American Dream is extensively illustrated with photographs, diagrams, and maps. This is must reading for all planners, designers, public officals, and citizens who want to envision and direct the future of their communities.